MEASURE Evaluation is working to enhance the capacity of governments to assess, address, and monitor alternative care in four countries: Armenia, Ghana, Moldova, and Uganda. All children should live in a supportive, protective, and caring environment that helps them develop their full potential. In 2009, it was estimated that globally 80 percent of children living in orphanages or residential homes have at least one living parent. Children live in institutional care because of extreme poverty, caregiver illness or disability, child physical and/or mental disability, the death of parents, or other circumstances. The Guidelines for the Alternative Care of Children, endorsed in 2009 by the United Nations General Assembly, provide state obligations, as well as roles and responsibilities of other actors, to ensure that children are not unnecessarily separated from their families; that temporary or other permanent forms of care provide a supportive, protective care environment; and that children living in residential care who have a family network can be reunified and reintegrated. 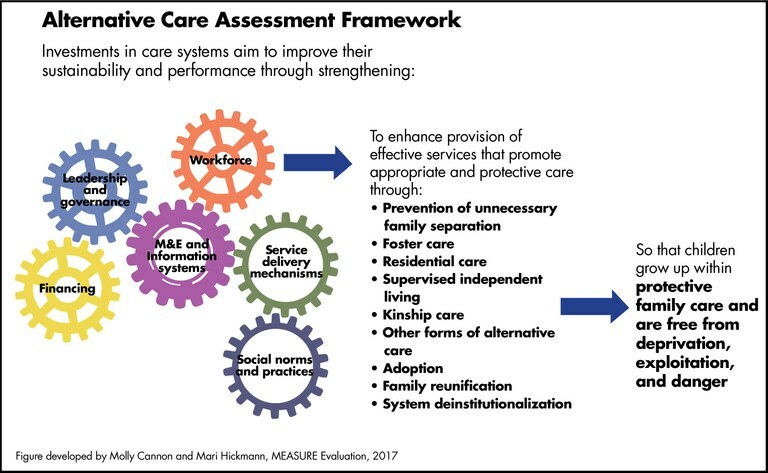 MEASURE Evaluation is working to enhance the capacity of governments to assess, address, and monitor alternative care in four countries: Armenia, Ghana, Moldova, and Uganda. Our work follows the best practices set out in the guidelines. Our work is guided by the Displaced Children and Orphans Fund of the United States Agency for International Development (USAID). The fund is housed within USAID’s Center of Excellence on Democracy, Human Rights and Governance (part of the Bureau for Democracy, Conflict and Humanitarian Assistance), which provides financial and technical assistance for the care and protection of vulnerable children. Our work is coordinated with the Better Care Network, an international network of organizations committed to supporting children without adequate family care around the world. In each of the four countries, MEASURE Evaluation is working with a core team—comprising lead government representatives, civil society representatives, and other partners—to enhance country capacity to assess progress on national care reform and set future priorities, and to strengthen country skills in collecting and using data to inform the strategic management of alternative care for children. Csáky, C. (2009) Keeping children out of harmful institutions: Why we should be investing in family-based care. London, UK: Save the Children. p7; Better Care Network. (2009). Global facts about orphanages.